Nightwing Actor Will Face "Gruelling" Commitment | Nerd Much? 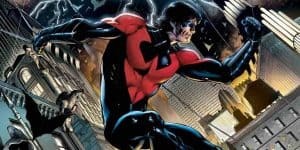 According to what can be called a brief set of interesting questions from fans and answers from director of the upcoming Nightwing Chris McKay (known for The LEGO Batman Movie) on Twitter, the future actor will have to love the DC hero as much as he does. There needs “to be [a] full commitment,” especially when the stunts will require grueling training in martial arts, and gymnastics. If that doesn’t sound intensive enough, McKay has made no secret how much he love the character of Nightwing. He has stated how Robin grew up “right in front of us” in the comics, as it wasn’t told through flashbacks or anything nearly as cheap. It was in “real time” and the audience, essentially, grew up with Robin as the issues came out and he slowly transitioned into Nightwing. According to McKay, Nightwing “was the window character with which we experienced Gotham city.” In other words, it was through Robin’s eyes that the audience saw the sprawl of Gotham city and the increasingly hypocritical Batman as a character within in that narrative. Depending on your interpretation of the comics, of course. That said, McKay won’t be the one penning the script, that task will go to Bill Dubuque, who is known for his work on The Accountant. As that is quite a well done film, it is difficult to say anything against Dubuque. Thus, fans can likely be confident that the script will be handled with the care it deserves. There is no release date for the Nightwing movie yet. Sources: Twitter 1, and 2.